Queen Nefertiti, one of the most famous Queens of Ancient Egypt is depicted in a chariot drawn by 2 regal horses. 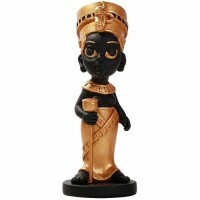 In bronze infused museum-grade resin, this stunning statue is 11 5/8 inches long with hand painted color accents. 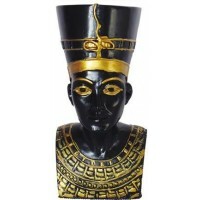 Amazingly detailed, this statue makes a great gift for all who love Ancient Egypt. Item Number: UI-WU77489A4 | Approximate Size (Inches): 11.58 wide x 3.50 deep x 7.50 high | Approximate Shipping Weight: 4.00 lbs.